The Bayelsa State Police Command has confirmed the arrest of two suspected cultists who chopped off the hand of a corps member, Luntis Julius, using a machete. The cultists were said to have attacked Julius, who is from Taraba State, during an attack on a corpers’ lodge in the Sagbama area of the state on Sunday. The Police Public Relations Officer, Bayelsa State Command, Mr. Asinim Butswat, gave the names of the arrested suspects as Mosan Youdougha, 22; and Godswill Vincent, 21. Butswat said a third suspect had also been caught but had yet to be handed over to the police, while the police were still on the trail of the fourth member of the gang. He said, “At about 12pm on Monday, the police, with the help of youths of Angalabiri community, arrested two persons involved in the attack and robbery of some persons at the corpers’ lodge in the area. The police said the cultists, during the Sunday mayhem which happened at about 2.30am, dispossessed the corps members of their belongings including a laptop and two mobile phones. According to The Punch, a corps member, who pleaded anonymity, had lamented the security problem in most of the corpers’ lodges in the state, saying the security promised corps members was non-existent. “Most of the corpers’ lodges are at the mercy of hoodlums and thieves. 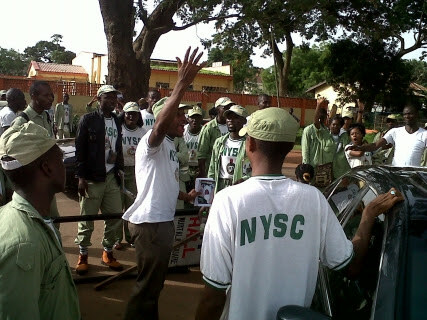 Female corps members are harassed on a daily basis,” the corps member had said. Also, during a recent stakeholders’ workshop organised by the National Youths Service Corps, the Coordinator of the NYSC in Bayelsa State, Mrs. Loto Bolade, had pleaded with employers to put facilities in place to address the issue of security and welfare of corps members. Meanwhile, the Bayelsa State Government has expressed concern that in spite of its efforts, moral decadence, drug abuse, cult activities and other social vices were on the rise among youngsters. The Commissioner for Information and Orientation in the state, Mr. Daniel Iworiso-Markson, made the observation when the Senior Pastor of Refined Peoples’ Church, Pastor Daddy Ken, paid him a courtesy visit in his office at Information House, Ovom, Yenagoa. The commissioner said the situation had reached a worrisome level with primary school pupils being initiated into cult groups.